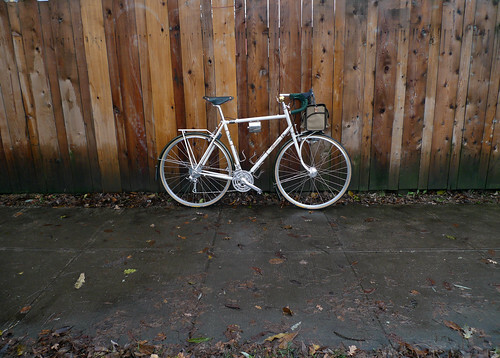 Bill's bike is a very stylish randonneur with a lot of subtle features. It has all the requirements for long hours in the saddle, which is a good thing, because Bill will be riding it in the 2011 Paris-Brest-Paris. This bike, which Bill has named "Clara," uses a custom blend of True Temper tubing. The front and rear racks are minimal and to the point. Both front and rear lights are run off the generator front hub. The bike has couplers, and the rear light is wired internally with strategic plugs for easily separating the frame. There is a small integrated light mount on the rear dropout which allows for a minimum of exposed wire. Everything about this bike is clean and purposeful. Best of luck in France, Bill!